Artist Stan Prokopenko shares his knowledge with more than 50,000 students every single day. 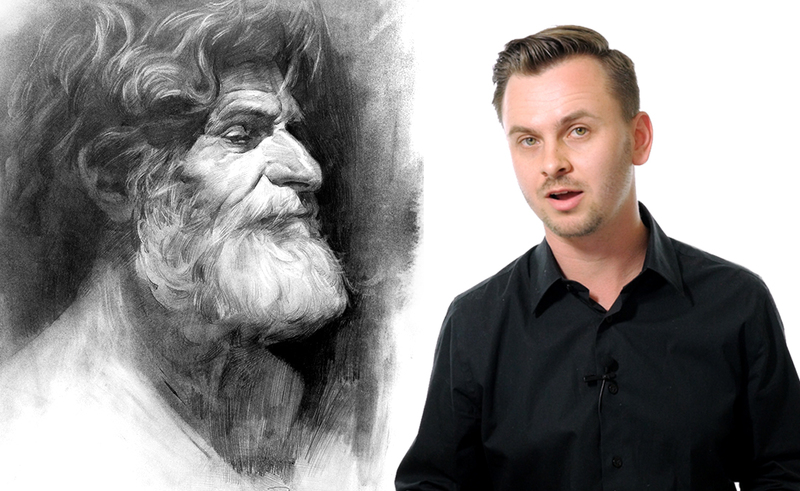 On his YouTube channel ProkoTV, he teaches literally everything there is to know about drawing from the ground up — and in case you’re thinking art lessons are stodgy, just know one of his most recent drawing tutorials is called How to Draw BUTTS!!!. Last month, Prokopenko’s 50,000-plus views per day translated to nearly two million views total, his highest month ever, and also brought in more than 40,000 subscribers, so it’s not surprising that at the beginning of September, he became a YouTube Millionaire. Prokopenko started his channel in 2012, with early videos — many of which now have millions of views — focusing on the minutiae of anatomy drawing. Now he’s got a much wider range of content, including critiques of viewers’ art and an Ask the Pros series, where he brings in working professionals from different disciplines to give viewers a well-rounded art education. Check out our conversation with Prokopenko below about what led him to draw in one million fans. Stan Prokopenko: It’s amazing to know that we have that many students. As a teacher, it’s rewarding when your instruction makes a difference. Making a difference in one million artists’ lives, that’s insane. I can’t even imagine one million people. SP: I had a blog with several tutorials that got a good amount of traffic. With YouTube getting really popular at the time, I thought it would be worth it to try to convert my tutorials into videos. I already had the information written and many of the visuals created, I just had to record some drawing demos and figure out an editing style. The videos were well received — six years later, I’m still doing it! SP: I focus on producing quality content. There’s a lot of noise, but quality gets noticed. As an educational channel, that means providing easy-to-understand lessons that the viewer enjoys watching. I try to keep production quality high, with good visuals and heavily researched and clear scripts. TF: Can you talk a little about your background in art? SP: I was always interested in art. Even in elementary school, I was known as the guy who likes to draw. At 13, I had a family friend who taught me oil painting for a few months. Nothing too serious, but it got me familiar with oil paint and even more interested in art. In high school, I took eight semesters of animation and four semesters of drawing/painting. I was president of the Art Club and started taking after-school classes at the Watts Atelier as a senior. I was really into it. I stayed at Watts Atelier for 10 years, as a teacher for the last five years, and now I focus completely on making instructional videos on Proko.com. TF: What got you interested in teaching others how to create, and why did you decide to teach on YouTube? SP: I always had the itch to teach. As a kid, I created a curriculum to teach my mom things I learned in class. For some reason, I thought she didn’t already know that stuff. She was a good sport. As a student at Watts, I would help newer students, and eventually people would ask me for help if the instructor was busy helping someone else. I think that helped me get the teaching position at a really young age. I picked YouTube because video is currently the best way to teach drawing and painting, excluding in-person, private instruction. TF: What’s your favorite thing about being part of the YouTube community? Are there any fellow art creators whose work inspires you? SP: Collaborating with other artists, including YouTube artists, is something I really enjoy. I’ve been doing more and more of it. I’ve been lucky enough to collaborated with people who inspire me. including James Gurney, Steve Huston, Glenn Vilppu, Aaron Westerberg, Aaron Blaise, Court Jones, Marshall Vandruff, Jazza, Ross Draws, Cesar Santos and many others this year at Comic-Con in a series I recently posted. TF: What’s your No. 1 piece of art advice for your fans (current and future!)? SP: If you’re serious about making art your career, then get serious about learning the craft. Make time for it. Treat your studies as a full-time job. If you want to succeed in this competitive field, make it your life. Photo courtesy of Stan Prokopenko. You can add yourself to the ranks of Prokopenko’s more-than-a-million YouTube subscribers at his channel YouTube.com/ProkoTV.